Skateboarding is one of the most popular extreme sports. And riding on a skateboardOh engaged both adults and children. To achieve success in this sport can help high-quality, well-chosen Board. Especially important is the choice of a skateboard for a child. The main criterion to consider when choosing a skateboard, this is the material from which it is made. Remember that the most strong, durable and flexible boards are made from canadian maple. The length of the skateboard has no special value for children and beginners in the sport. But if your child is much larger and higher than their peers, choose a skateboard for him any longer. But the width of the skateboard for a child – this parameter is quite significant. If your child is relatively short, and the size of his legs not bigger than other guys his age, choose his skateboard, the width of which does not exceed 7.5 inches. The most appropriate options for the stalwart skateboarders is a Board with a width of up to 8 inches. Only when your child completely mastered the basics of skateboarding, pick the width of the Board for him depending on riding style. If your child is crazy like "cool" skateboard, prefer narrow, more maneuverable Board. If he makes excellent slides and is engaged in jumping off of stairs, choose for the young athlete sustained a wide skate. Versatile medium width Board – 7.75 in. Each skateboard has its own expiration date. Therefore, choosing it for a child, give preference to the Board made in the current year. Remember that the longer the skate is stored, the more it is deformed. Make sure that the surface you liked skateboard is completely flat. To do this, lift the skate and look at it from the end. In this position of the Board you will notice all the irregularities on its surface. 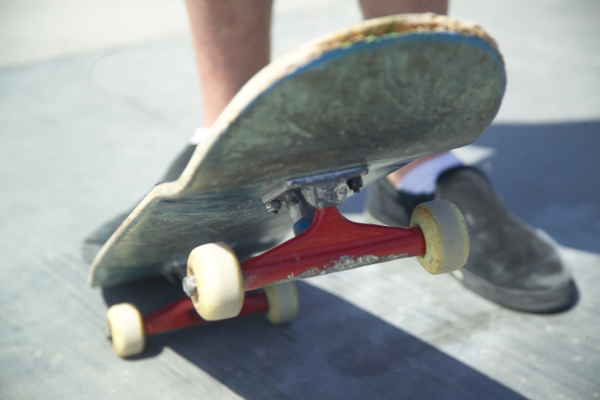 When choosing a skateboard for a child, please note the suspension parts that connect the wheels to the Board. Prefer aluminum suspensions with steel rods. Wheels good skateboard for a child need not be too hard. The harder the material of which they are made, the higher the speed of the skate, but worse than his grip for skating. Wheel is perhaps the most important part of the skate, which largely determines its characteristics. Even if the skateboard is simple, with good and properly selected wheels it will still demonstrate excellent ride quality. Diameter is one of the most important parameters of the wheel, which greatly affects the driving characteristics of the skateboard. Small radius is the value from 48 to 52 mm. These wheels are perfect for very smooth surfaces such as special coatings in skate parks or very fresh and high quality asphalt. They will provide the Board with unprecedented maneuverability. But high speed with these wheels, not to develop, and any obstacle can be for them. The average radius of from 50 to 52 mm – great for conventional asphalt in the streets. But a large radius (from 52 to 56 mm, and more) gives you the real speed and great maneuverability of the skateboard in terms of cracks, chips, or other obstructions on the pavement. But these wheels are the most difficult. Optimal for normal driving can be considered wheels from 52 to 54 mm, it is the middle option that enables you how to jump on ramps, and good control of your skateboard on the street. It should be remembered that sooner or later the wheel will still wear out, so buying too small without clear objectives is not necessary. Choosing a good wheel, don't forget about the bearings. They also must be of good quality and brand, otherwise the wheels will not show itself in all its force. Hard wheels are better hold speed and accelerate faster, and soft, but can do well with noise like twigs, stones or cracks. Rigidity is marked with the parameter "A", the hard wheels – 101A. For street riding it is better to take a fairly rigid, not below 98A, otherwise you'll have to crawl in the rear, riding with a group of friends. For many skaters an important parameter of the wheels is the color or the pattern they depict. Undoubtedly, it deserves attention, but remember that the quality of skiing has no effect. Brand wheels, of course, guarantee you a certain level of quality, but the price is slightly higher than the Chinese ones. Among the brands you can select those for whom the wheel is a main product, and those that make the wheels together with other sports equipment. Most known for their quality following brands: Pig Wheels, Аutobahn, Spitfire, Hubba Wheels, Ricta, Satori Wheels. Other very good proizvoditeli: Element, Toy Machine, Black Label, Zero. Good wheels for the skateboard cost about 1200-1500 rubles per set.